What if I need to withdraw from the class? As a parent what is my role in class? How should we use the Music Together® materials? When registering for class, why do I have to choose a first and second choice class preference? Music Together is designed for children ages birth through age 8. At Music Together, we believe that music ability is as much a basic life skill as walking and talking, and that all children can learn to sing in tune, keep a beat, and participate with pleasure and confidence in the music of their culture. Music Together classes nurture the child's natural enthusiasm for music and movement as we sing, dance, chant, and play instruments in an informal setting that will enrich a child's musical environment and guide towards a lifetime of music-making enjoyment. Our Mixed Ages (0-5 years) and Babies (0-8 months) classes are designed for family participation, so children attend with a parent or caregiver. Our Rhythm Kids (4-8 years) classes are drop-off and do not require parent participation. In the 1980s, Music Together pioneered the development of the mixed-age approach in early childhood music. In each class we strive to create a musically rich, developmentally appropriate environment where the whole family can enjoy music and nurture skills at the level right for each child. Children of different ages thrive when they interact with each other: the babies are often fascinated by the older child, and the "big" children enjoy helping and sharing with the "little" ones. This approach is based on research from music education, early childhood development, and family relationships, as well as Music Together's nearly 30 years experience in the field. Each Mixed Age (age 0-5 years) and Babies (0-8 months) has 6- 12 registered children plus their respective caregivers. Rhythm Kids classes (4-8 years) have 6-12 registered children and are not required to have a caregiver present in the class. Throughout the semester, Music Together classes may be in session when older children have a school holiday. Older siblings of registered students may occasionally visit provided the older sibling is healthy and that the visit is prearranged with the teacher. Visitation spots are available on a first come, first serve basis. Makeups are available at any location, with any teacher, in any age appropriate class during the current semester. Please schedule a make-up online using the makeup scheduler. Makeups do not carry over from previous semesters, but you can schedule makeup classes prior to missing your regular class. Changes can be made depending on class availability. Contact Marsha at marsha@marshasmusic.com. Families wishing to withdraw from class must do so before the the first day of classes of each semester to receive a refund. Non-attendance does not constitute a withdrawal and all tuition fees are forfeited if we are not informed of your withdrawal prior to first day of class. More details about our tuition policies available here. If circumstances necessitate withdrawal from class, contact Marsha at marsha@marshasmusic.com. Late registration will be handled on a case-by-case basis, but generally possible during the first two weeks of class. 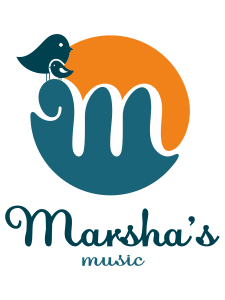 Contact Marsha at marsha@marshasmusic.com. Please feel comfortable to nurse your child in class, but we ask that you do not bring food or drink into classrooms. All parents, grandparents or caregivers are welcome to attend class at any time, no need to ask. Whole family music making in your home is extremely valuable to your child's musical development, and attending class occasionally helps the other family members to join in at home. Enhance your child's experience in class by remembering to sing, sing, sing. Your active participation is the key to your children learning and growing musically. Support the creation of a music only environment while in class by not talking to your children or other adults during the 45 minutes. Since it is difficult for a young child to mask out adult conversation, please wait to socialize until after class, and instead contribute to the creation of a musical environment for the children to absorb. Try not to give verbal directions. It can be tough to restrain the impulse to give your child directives such as "Do what she is doing, hold your instrument this way," but children respond best by just seeing and hearing you doing (and enjoying) it yourself! Wandering toddlers is fine, but if you want your child to come back to you, avoid calling to him from across the room. If necessary, redirect your child physically back to you or the circle. Of course watch out for your child's safety, but mostly your job is to just relax, and have fun! Enter your Access Code from your book to add your current song collection to the Hello Everybody App and the Family Music Zone! All of your current semester songs will be added to your music library, both on the Family Music Zone and on the Hello Everybody app. You can also view a digital copy of your songbook, get new activities to try at home, and sing along karaoke style! Play the music at home and in the car as frequently as possible, especially during the first few weeks of class. Make it available to your child to listen to while she is playing or before nap or bedtime. Use the songbook to help you remember the songs, to play along if you play an instrument, and at lullaby time and storytime. Since classes are participatory and educational experiences between adults and children, we ask our families to please refrain from taking photo or video during class time, however we welcome pictures before or after class. Occasionally, classes at Music Together are professionally photographed and/or videotaped. These photographs/videos are sometimes used for publicity purposes. Parents will, in instances where these images are intended for publicity purposes, be asked to sign the appropriate release forms. E-Gift certificates for Music Together classes can be purchased online. They make a nice baby shower or birthday gift. Grandparents love to buy these for holiday gifts. We have to restrict the number of children enrolled in each class to maintain the close-knit relationship of a family music class. Since certain class times are more popular, so we ask that you list a second choice so we can accomodate as many families as possible. However, if you cannot attend your second choice, please note that in the comment section on the registration page.